I realized recently as I was looking around my house that I have a lot of baskets. I love organizing with baskets or totes or anything similar to a basket form. I think I probably have a basket in every room in my home. I probably have the most baskets in my bedroom and closet. They are a great way to store smaller loose items, accessories or small articles of clothing. We have quite a few pairs of slippers and since they didn’t have a designated home they ended up all over the house. The other problem with that is since they were scattered, sometimes I could only find one slipper. Quick solution – a basket. It simply sits in the corner in our bedroom and now I know exactly where my slippers are and I know where to put them when I am done with them. The closet is another place I have multiple fabric storage bins. I try to use every inch of space for storage. This probably means I should have less stuff but in the meantime, I am working on having a more organized home. 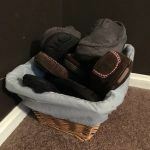 Instead of just shoving clothes or accessories under the bottom shelves or on top of the top shelf, baskets offer a great organization solution. Not only will you know where your items are but it looks so much better! The baskets on the top shelf are great for storing items you don’t often use. 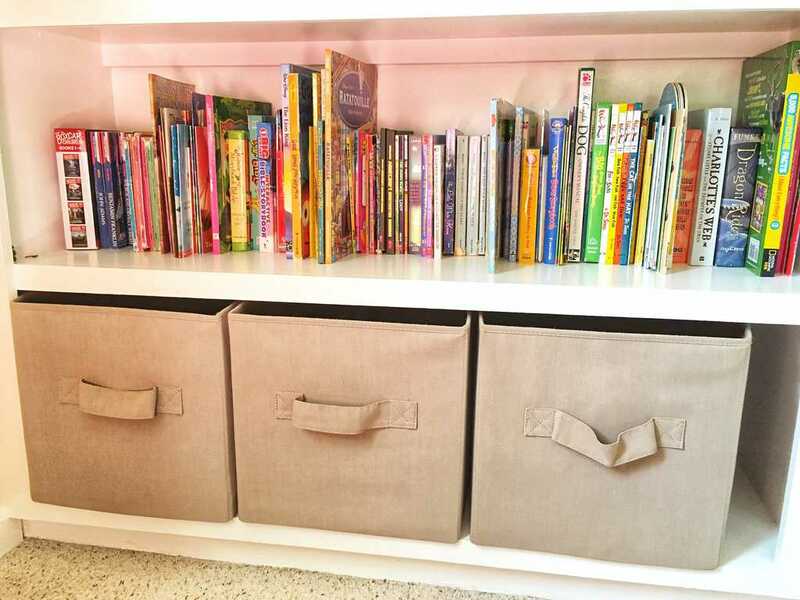 Some ideas may be to store belts, scarves, undergarments, tights or work clothes (for around the home or yard work). Really the list is endless and I’m sure your storage needs are different from mine but those are some ways I use them. 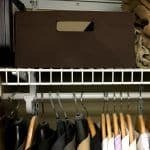 If you need closet storage ideas, check out my How to Organize Your Clothes – Closets and Drawers or Best Closet System. With a husband who loves shoes, 2 kids and myself, there are shoes everywhere in my home. Similar to my slipper issue, sometimes it was a struggle to find both shoes in the pair. I’m not sure how but my daughter could leave one shoe in the basement and one shoe in the living room. I discovered a great way for our family shoe problem was that each person has their own basket. 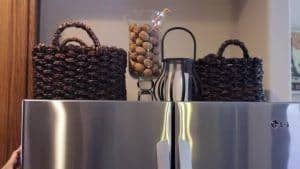 The kitchen may not be the first room you think of when you think of storing with baskets, however, you may be surprised. On top of your fridge is a great place for storage. Whether you want to store snacks, lunch items or paper goods, it is a great place to add storage to your kitchen. eHow shows how to decorate the top of your fridge for storage including baskets. In your kitchen pantry or shelves, small baskets (or even plastic bins) are ideal for sorting loose items like granola bars or fruit snacks. They also work for small jars like spices. This is handy since it allows you to pull all the jars out and look at them instead of trying to reach through them all to get to that last spice jar in the back. We also use fabric bins in my son’s room on his bookshelf. I think the biggest culprit of the mess in our house is toys. They are kind of like rabbits in that they quickly multiply. 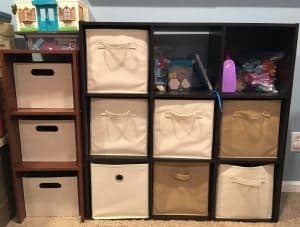 My best storage for toys is baskets and fabric cubes. I know this may sound repetitive but again, each bin has it is own kind of toy. Whether it is dolls, legos, Lincoln logs or matchbox cars they all have a home in a fabric bin. For miscellaneous items, I also have bins designated for each child. 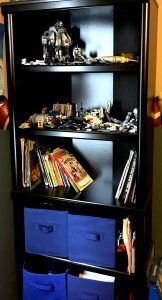 If you need toy storage ideas, check out my page Organizing Toy Ideas. 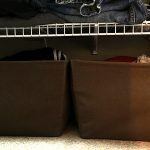 Small plastic baskets are great for storing small items in your bathroom drawers or on shelves. You can use these baskets to sort your different supplies – makeup, nail polish, toiletries, medicines, etc. If you don’t have any storage for towels, roll up your towels and store them in a large basket like this photo from Life Storage. 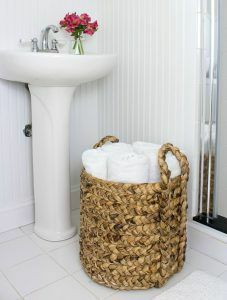 You could also do this with a small basket for hand towels on your bathroom counter. I use a large basket to store my clothes that need to be ironed. Since ironing is definitely NOT my favorite household chore, once the clothes are washed it sometimes takes a little while before I get to ironing them. So I put them in a basket until I am ready to iron. I am honestly not sure how I ended up with so many baskets or storage cubes in my home but they have definitely put to good use. Even now are we are purging some items in our basement, I am finding more empty baskets and bins. I won’t be throwing them out because I know at some point they will be put to use. 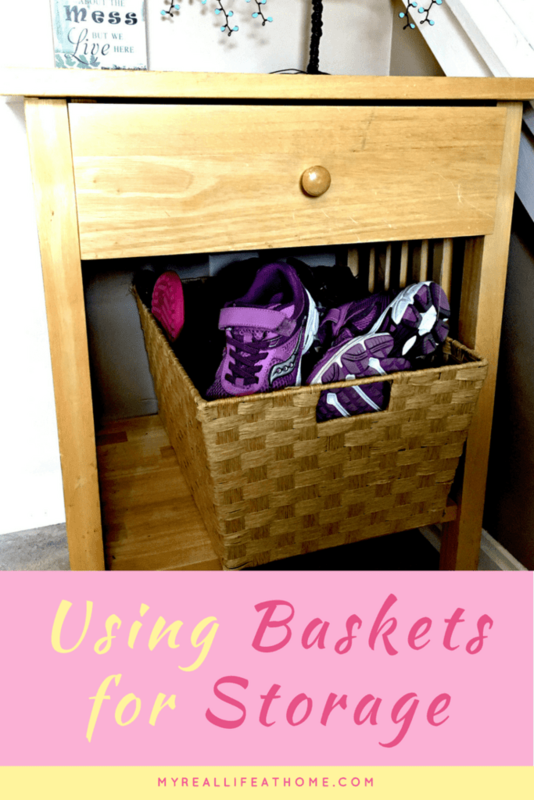 I would love to know if you use baskets or bins in your home. What’s the best way you have found to use them? If you have any questions for me please leave them in the comment section. I would be happy to answer them as best as I can. 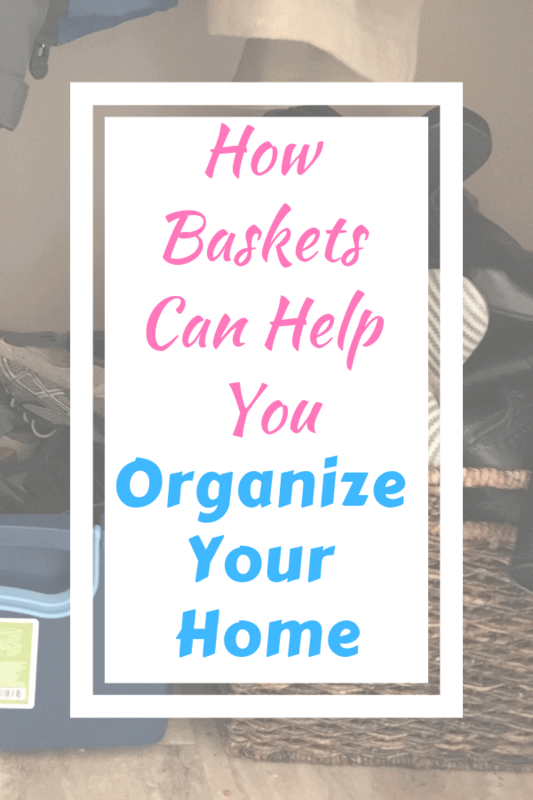 Do you think that baskets keep things more organized or less organized? I love using baskets to be more organized. 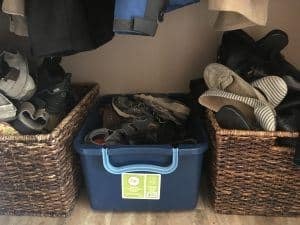 You can get baskets or cloth bins in all shapes and sizes. Also, I love the fact that it hides what is in the basket. I have a lot of baskets in my home. I love your idea of putting baskets on top of the refrigerator. Mine is unsightly so I will definitely put a basket up there so I don’t have to look at all the random items. Baskets are great! Another reason I love baskets is that you can always find one that matches your room. I love this!!! I think baskets are such a good way to organize, and they look so nice. Agreed! I think they are great because they are functional decor. LOVE baskets! You can never have too many…ha ha! Great tips! I absolutely need to try this hack!! Everything is spilling over in my home. Should try this soon!!! I didn’t even realize how many places I use baskets in my home to organize until I started looking! They are definitely a great organization option. I totally use this same basket trick, and it’s a lifesaver!! Baskets errrrrrrrywhere. It’s funny, the other day I was looking at something and realized I was using a basket for organizing. I had never even realized it before, even through writing this blog post. Yes! Baskets everywhere! I love using baskets to keep things in order. Completely agree. 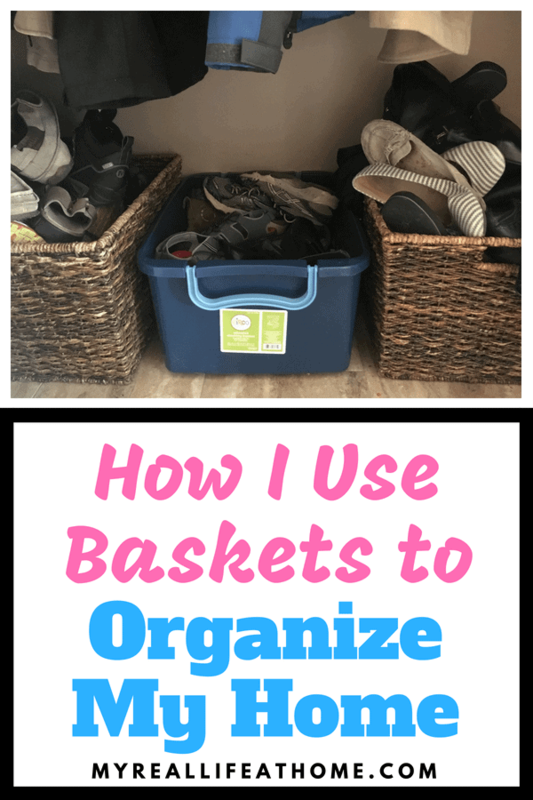 What do you think is your best use of baskets in regards to organizing? I absolutely love baskets! They provide such great texture and color in a room, and you can get them in so many different styles. I also love that they hide clutter easily and well. Absolutely! 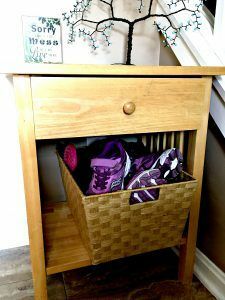 I love finding things that serve a dual purpose and baskets do that with organizing and decor.